Tepees of the Shoshoni tribe. A new tipi made to look like one from long ago. A tipi (also called tepee or teepee) is a kind of tent. It is cone-shaped. They were made by Native Americans of the Great Plains who frequently moved from place to place, following buffalo or other animals Native Americans hunted. Tepees are made from long poles, and are covered with material. Long ago the material was animal skin or tree bark. Today, they are made from cloth. Tepees were put up in as a circle, which symbolized the life. Tepees are no longer usually used for a full-time home, but they are still used for special occasions. Tepees were used by the Lakota. The Plains Indians would sometimes paint and mark their tepees, and put signs to mark off evil. They usually made the cover from buffalo skin (tanned hide). 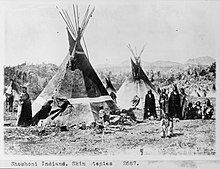 Wikimedia Commons has media related to Category:Tipis. This page was last changed on 18 January 2018, at 06:13.